Welcome to the electronic version of Storyknife articles. From the beginning, Calista Corporation prioritized Shareholder involvement and environmentally responsible development. During the early stages of the Alaska Native Claims Settlement Act, Calista’s regional leaders identified the Donlin Creek area as one full of potential: Potential for Calista to fulfill an ANCSA mandate to safely and responsibly develop natural resources; and the significant potential to provide opportunities to Calista Shareholders and Descendants. In 1996, Calista and The Kuskokwim Corporation struck an agreement for mining rights with Placer Dome, which has since been purchased by Barrick Gold. Today, Donlin Gold LLC is equally owned by Barrick Gold and NOVAGOLD. 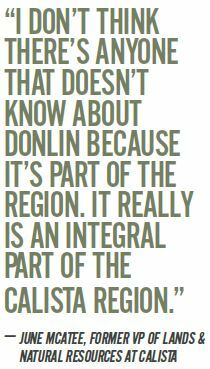 Lately activity at the Donlin site has slowed as the project waits to receive necessary permits before moving forward. The project’s environmental review process began in 2012. This process ensures the mine’s plans are safe for the environment and wildlife. In August, the U.S. Army Corps of Engineers and the U.S. Bureau of Land Management issued their Record of Decision. The Project received a combined permit under Section 404 of the Clean Water Act and Section 10 of the Rivers and Harbors Act. Additionally, BLM issued the Offer to Lease for the right-of-way to cover portions of the natural gas pipeline that would cross federal lands. The project anticipates receiving most of the required state permits by early 2019. June McAtee, former VP of Lands and Natural Resources at Calista, worked as vice president for 20 years, under five Calista Presidents and CEOs. Before becoming vice president, June worked 10 years as a geologist for Calista Corporation and was integral to the grassroots exploration process of the Donlin project. Connect with your Corporation, Sign Up for the Digital Storyknife!